Do you want to learn how to draw realistic eyes? To begin with, let Fig. 1 represents an actual normal eye. At Fig. 2 we have removed the skin and muscles and exposed the two main structural features in the form of the eye, namely the bony ring of the socket and the globe containing the lenses and retina. Examining this opening, we find from A to B that it runs smoothly into the bony prominence at the top of the nose, and that the rest of the edge is sharp, and from point C to E quite free. It is at point A, starting from a little hole, that the sharp edge begins; and near this point the corner of the eye is situated: A, Figs. 1, 2, 3. From points A to F the bony edge of the opening is very near the surface and should be looked for. The next thing to note is the fact that the eyebrow at first follows the upper edge of the bony opening from B to C, but that from point C it crosses the free arch between C and D and soon ends. 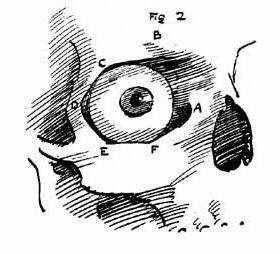 So that considering the under side of the eyebrow, whereas from point C towards B there is usually a cavernous hollow, from C towards D there is a prominence. The character of eyes varies greatly, and this effect is often modified by the fleshy fullness that fills in the space between the eyelid and the brow, but some indication of a change is almost always to be observed at a point somewhere about C, and should be looked out for. Any bony prominence from this point towards D should be carefully constructed. Look out for the bone, therefore, between the points CD and AF. Never forget when drawing an eye that what we call the white of the eye is part of a sphere and will therefore have the light and shade of a sphere. It will seldom be the same tone all over; if the light is coming from the right, it will be in shade towards the left and vice versa. Also the eyelids are bands of flesh placed on this spherical surface. They will therefore partake of the modelling of the sphere and not be the same tone all across. 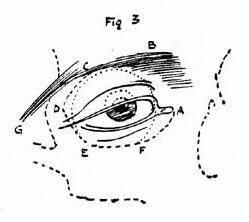 Note particularly the sudden change of plane usually marked by a fold, where the under eyelid meets the surface coming from the cheek bone. The neglect to construct these planes of the under eyelid is a very common fault in poorly drawn eyes. 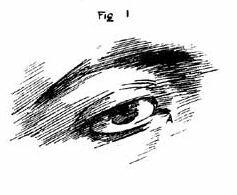 Note also where the upper eyelid comes against the flesh under the eyebrow (usually a strongly marked fold) and the differences of planes that occur at this juncture. In some eyes, when there is little loose flesh above the eyelid, there is a deep hollow here, the eyelid running up under the bony prominence, C D. This is an important structural line, marking as it does the limit of the spherical surface of the eyeball, on which surface the eyelids are placed. Fig. 4 is a rough diagram of the direction it is usual for the hairs forming the eyebrow to take. 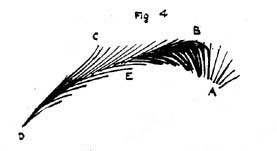 From A, a few scant hairs start radiating above the nose and quite suddenly reach their thickest and strongest growth between B and E. They continue, still following a slightly radiating course until D. These hairs are now met by another lot, starting from above downwards, and growing from B to C.
An eyebrow is considered by the draughtsman as a tone of a certain shape and qualities of edge. And what interests us here is to note the effect of this order of growth upon its appearance as tone. The meeting of the strong growth of hair upwards with the downward growth between points B and E creates what is usually the darkest part of the eyebrow at this point. And the coming together of the hairs towards D often makes another dark part in this direction. The edge from C to B is nearly always a soft one, the tone melting into the flesh, and this should be looked out for, giving as it does a pretty variety to the run of the line. Another thing that tends to make this edge soft is the fact that a bony prominence is situated here and has usually a high light upon it that crosses the eyebrow. From C to D you usually find a sharper edge, the hairs running parallel to the line of the eyebrow, while from D to B and A to B a softer boundary can be looked for. The chief accent will generally be found at B, where a dark mass often comes sharply against the tone of the forehead. The eyelashes do not count for much in drawing a head, except in so far as they affect the tone impression. In the first place they shade the white of the eye when the light is above, as is usually the case. They are much thicker on the outer than on the inner side of the eyelids, and have a tendency to grow in an outward direction, so that when the light comes from the left, as is shown by arrow, Fig. 5, the white of the eye at A1 will not be much shaded, and the light tone will run nearly up to the top. But at B4, which should be the light side of this eye, the thick crop of eyelashes will shade it somewhat and the light will not run far up in consequence, while B3, A2 will be in the shade from the turning away from the direction of the light of the spherical surface of the whites of the eyes. 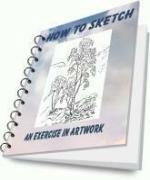 Get the idea to have your eye pencil drawings? Are you learning anatomy and physiology? Check the most comprehensive human anatomy course which covers everything you want to know about skull. "Unbelievable content in this membership, including extensive lessons: Blueprint Step by Step Guide, drawings, diagrams with labels and more." I highly recommend Human Anatomy since you can even print detail parts of a skull. In fact, all parts of a human body!